Our self contained guest apartment comfortably accommodates up to 2 people. The nightly rate for the one bedroom ground floor apartment is based on up to two people. There is an option for 4 adults with 2 bedrooms. The 2nd bedroom available is located upstairs along with a large home theatre lounge and wrap around balcony. The second bedroom is at an extra charge. Please note the second lounge is connected to the owners living quarters, however has been made so there is little to no contact with the hosts although we can interact as little or as much as you like and are available as needed for local knowledge and information. We have two friendly cats that enjoy interaction. Therefore unfortunately are unable to accommodate your much loved fur pet. No more than 2 cars parked on the property. For those who like golf, Auckland's finest Titirangi golf course is only 10 mins drive by car. The oven is a convection oven/microwave. We have had guests stay 3 weeks and this has suited them fine. 55 inch Flat Screen HDTV television connected to a DVD player. We both are keen golfers and can point you in the right direction for great courses Public and Private. The HideAway is a perfect home away from home! This place is immaculate and so well taken care of, the owners prepare you for everything and include beach items for your use, mosquito protection, a washing machine and breakfast items for your first morning there! My husband and I both agreed that this was by far the nicest place we've been and, to top it all off, they have the sweetest cats in the world. Their cat Lucy gave us the nicest welcome and a sweet goodbye when we left, as if she knew exactly what we needed. 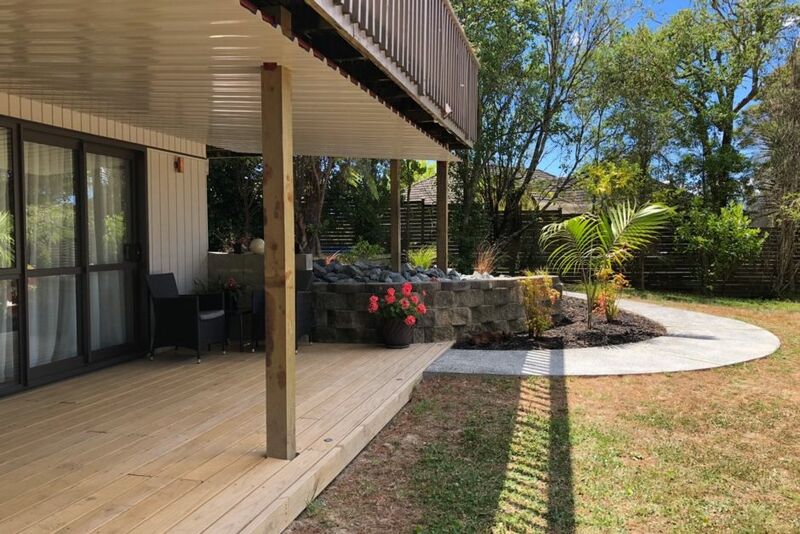 We would definitely recommend this property to anyone visiting Auckland. Thank you so much for your lovely comments and thank you for leaving our property so clean and tidy. We would have no hesitation in recommending you to other hosts. Hope you enjoy the rest of your stay in New Zealand and you are welcome back anytime. Thank you Roger for your kind comments. You are welcome back anytime. Fabulous property, great facilities, modern and new with great privacy. Fabulous property, great facilities, modern and new with great privacy. Highly recommend. Awesome property to stay at, immaculate in every way, would thoroughly recommend. Really new with quality fittings. Really new with quality fittings. Everything we needed was there and tv was set up with Netflix. Very quiet and peaceful and we met a super friendly cat called Lucy. Will definitely stay again. Thanks!